What a cute test for my cat blog! 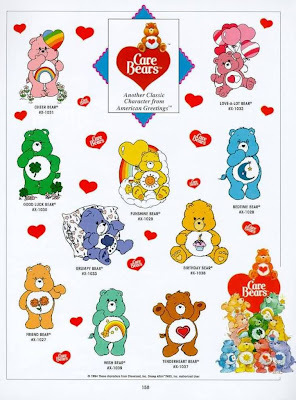 Did you own a Care Bear when you were a kid? Here's your chance to see which adorable fluffy bear is your true soul-bear. Each Care Bear comes in a different color with unique belly badge symbolizing their persona. According to Blogthings, I am Tenderheart Bear, the classic brown Care Bear that truly cares, how cute! So which adorable Care Bear are you? Take the quiz to find out, have fun! You are an incredibly caring and compassionate person. You wear your heart on your sleeve. You know how to help others when they are hurting, even if they don't know they want to be helped. You are a natural leader, and people look to you to figure out what the right thing to do is. You inspire others to be more caring and loving through your selfless actions. You are a laid back and calm person. You find it easy to relax and let go. You love to sleep, and you've been known to curl up for a nap at almost any given time. You are a homebody, and you love to be comfortable. You don't cause a fuss about much. You are always encouraging your friends to take it easy and rest a bit more. You think people work themselves too much. You are naturally happy and upbeat... some people think unbelievably so. Your perkiness is 100% real. You are just a jubilant person who loves life. You always have a smile on your face. You choose to be cheerful and look on the sunny side of life. You know just what it takes to cheer someone up, and you're always happy to brighten someone's day. You are definitely a lucky person, and you believe that you make your own luck. You try to spread your luck around. You do your best to make sure your friends share in your good fortune. You are a total optimist. You are always hopeful that things will work out for the best... and they usually do. You are confident and sure of yourself. You don't let self doubt weigh you down. Whoaho, nampaknya sampai sekarang tak da yang sama dengan Rizal. You love your friends and family, and you would do almost anything for them. If someone you care about has a wish, you're going to do your best to make it come true. You enjoy helping people, but you don't like to boast about it. You work quietly. Making someone's day is its own reward. You are content to bring a smile to someone's face. :* :* :* :* Monica FC! Thanks sweetie, putting up ur badge now! Nice result for u Michael, so are u a homebody too? ?